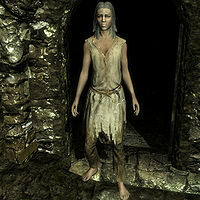 Hefid the Deaf, a Nord beggar, is part of the insane community found in the Ratway Warrens in Riften. She is locked in a dark room and will not emerge unless her attention is broken. This can be done either by behaving violently around her, or if Knjakr the Chef, using the grinding wheel up the stairs, notices you and attacks you. She will flee, running to other parts of the Ratway Warren. Her voice is rough, but sounds young, however her appearance is very aged. There are paw-scratch shaped scars down the left side of her face. Some of her dialogue includes "Ha ha ha ha! No! Never find me!". Speaking with her will result in her saying "Go away. Go away. Go away!" and activating violent mode. She repeats a variant of "Inkpot. Stone. Bucket. Book. Knife. ", "Bucket. Knife. Book. Inkpot. Stone. No, no, no." and "Knife. Yes. Book. Yes. Bucket. Yes. Inkpot? No." She carries items related to the items she lists, a burned book, a bucket, a flawless garnet, an inkwell, and an iron dagger. In addition she wears ragged robes and carries a spare belted tunic. Esta página foi modificada pela última vez à(s) 18h56min de 4 de maio de 2014.